I was excited to go to this show because it was at 6pm. Please can we have more matinee shows please! 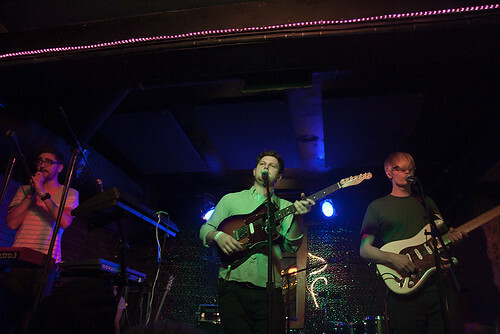 Alt-J seem to me to be an easy band to like but a hard band to love. At the heart of the band are its idiosyncratic lyrics and folkish harmonies. I know they have been very successful very soon in their career, but I was surprised by how completely confident they were. There was not a hesitation even when relying vocal tricks to hold a song together. I thought that the drummer was a hired hand as he seemed to play like a drum machine, following the band not pushing it. I was wrong however as he appears to have been present from the start. Perhaps what I was hearing was an aspect of a studio oriented band reproducing their stuff on the road. Despite the intellectualism there were times when the band really go goiing and people began to dance. I would like to hear more of this aspect of Alt-J. A recent NYT article entitled If You Like the Moody Blues, Try Alt-J seems to completely miss the point of Alt-J. They are not bombastic, but subtle.